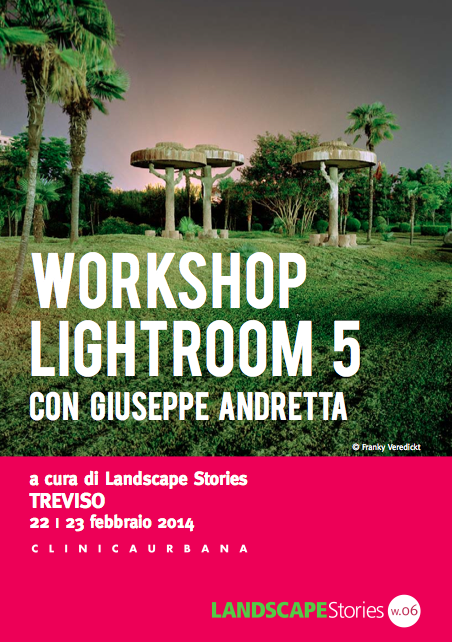 Two days with Giuseppe Andretta, Adobe Certified Instructor, to learn how to use Adobe Lightroom 5 like a pro, a powerful photo editing tool. The workshop will begin with a reading of the works of great photographers and their approach to postproduction of images. Followed by a technical study on the management of photo archives, up to advanced post production and project publishing. From identifying the workflow that best suits your photo editing needs to the advanced use of metadata and the integration with Adobe Photoshop. A workshop to learn the importance of transferring images from the camera, their sorting, grading and editing, the differences between the various digital formats, color management, stages of development and correction, input and one output sharpness, the creation of books, printing. You will also learn the new features of version 5: among others, the enhanced Spot Healing Brush for fast image correction and easily removing objects, Upright™ technology to straighten the photo, radial blur to emphasize and control selected areas of the image. The workshop is open to photographers, graphic designers, photo enthusiasts and onlookers that, laptop in hand, will be able to operate directly on their images with direct feedback from the lecturer. Giuseppe Andretta is one of the most renown Italian expert in digital postproduction and and color management. He is an Adobe Certified Instructor in Photoshop CS6 and a Apple Distinguished Professional in Aperture 2. In 2008 together with Marco Marconato, Adobe Print Specialist, he founded Color Connection. He provides professional training courses and consultancies on Adobe softwares together with color management services, fine art printing and high-end digital postproduction. He works with Leica, Apple, Wacom, Nikon, Epson and X-Rite. Specialties: Digital color management. Industrial photography. Digital images editing and photo retouching. Raw capture and digital imaging software training: Adobe Camera Raw, Adobe Photoshop Lightroom 5 and Adobe Photoshop CC and X-Rite color management solutions. The workshop has a limited number and will be activated with a minimum of 10 and up to a maximum of 20 participants. It is suggested to submit the application form in advance.